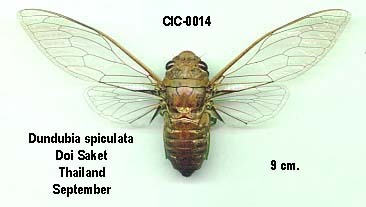 Meimuna tripurasura (Distant, 1881) is a cicada found in India. 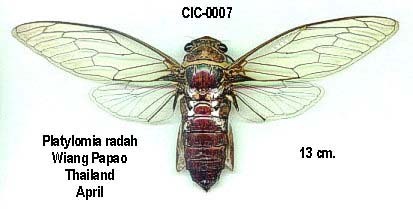 Meimuna tripurasura was formerly known as Cosmopsaltria tripurasura. [Male] Head pronotum and mesonotum ochraceous. Head: front with a triangular black spot near base and transverse black striae. which do not meet in the centre; vertex with two large oblique and irregular black fasciae. on disk, and a large irregular black spot on inner margin of eyes. Pronotum with two central longitudinal black fasciae, and three oblique black striae on each side the outer one submarginal and somewhat rounded. Mesonotum with a large central clavate spot, of which the apex terminates on anterior margin, bordered on each side by a subconical spot, followed by a small triangular one and a large submarginal fascia, black. Abdomen dull sanguineous, with a series of discal segmental black fasciae (they are much larger in some specimens and subconfluent). and a lateral segmental row of irregular spots. 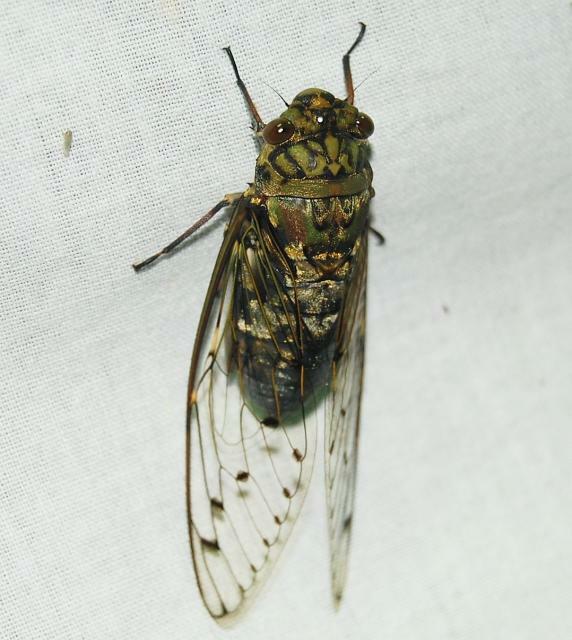 Body beneath with the sternum ochraceous, covered with greyish pubescence. Abdomen dull sanguineous; opercula pale sanguineous; legs ochraceous. Tegmina and wings pale hyaline. Front very prominent and convex; head, including eyes, narrower than base of pronotum, subequal to mesonotum in width. Opercula subtriangular. well separated at base, gradually becoming more divergent, and narrowing to apex, which is obtuse, and reaches the fourth abdominal segment. Anterior femora armed with three spines; two moderately large and ochraceous, apical one small and black. Posterior tibiae with three black spines on inner side near apex, and two smaller and wider apart on outer margin. Long. excl. tegm. [male] , 33 millim. Exp. tegm. 85 millim. 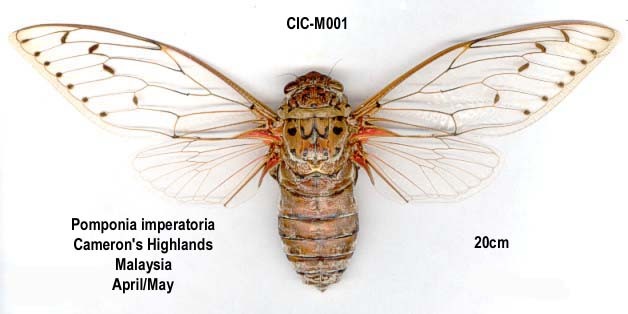 Champaka meyeri (Distant, 1883) is a cicada found in Indonesia. 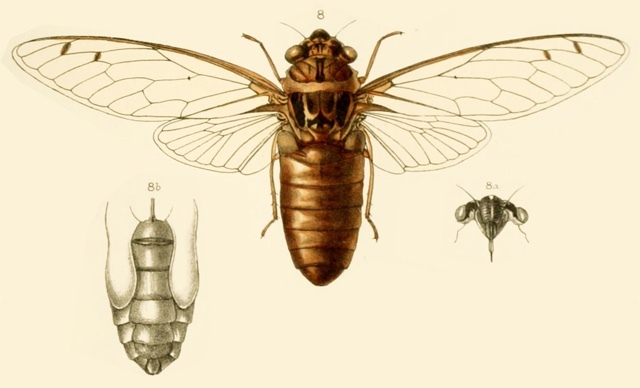 Champaka meyeri was formerly known as Cosmopsaltria majuscula. Body above warm-ochraceous. Head with the front, — excepting base and apex, — the area of the ocelli, and a larger spot on inner margin of eyes, dark castaneous; eyes ochraceous, with their inner area olivaceous. Pronotum with a broad central longitudinal castaneous fascia and a small castaneous spot near anterior lateral margin. Mesonotum with five blackish fasciae, the central one very slender and joining a triangular fascia in front of basal cruciform elevation, on each side of the central fascia is a short and broader one, and the lateral fasciae are long, broad and slightly curved. Abdomen above ochraceous. 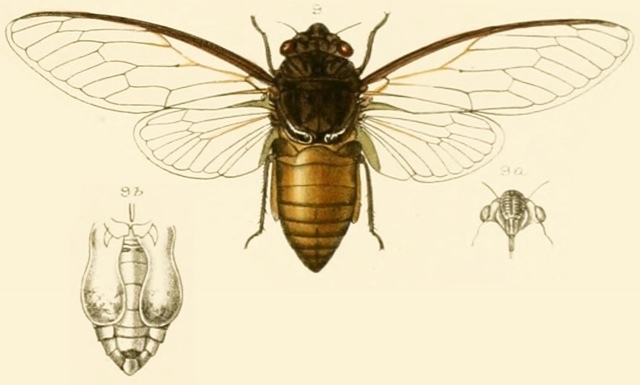 Body beneath ochraceous; the face blackish, with a central ochraceous spot near anterior margin, and a black marginal spot between eyes and face; legs pale castaneous, the inner margins of anterior femora blackish, anterior and intermediate tibiae and tarsi somewhat darker castaneous, the posterior tarsi ochraceous. Tegmina and wings pale hyaline, the venation ochraceous, but becoming fuscous towards apical areas; the tegmina with the costal margin fuscous beyond base of upper ulnar area, and the transverse veins at bases of second and third apical areas infuscated. 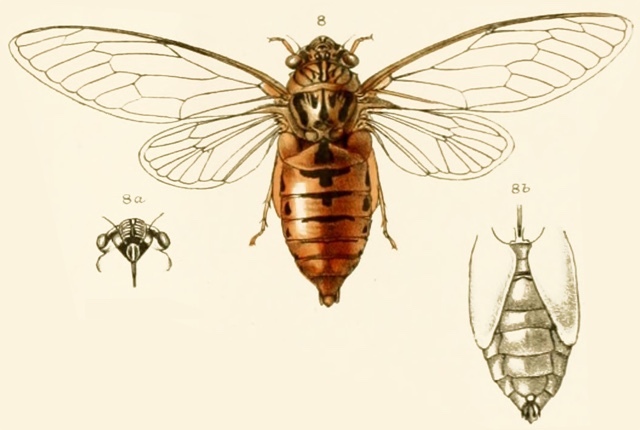 The body is long and broad; the rostrum reaches the posterior coxae; the opercula are slender and placed widely apart, concave on each side beyond base, but very slightly so outwardly, the apices rounded and reaching the fourth abdominal segment.